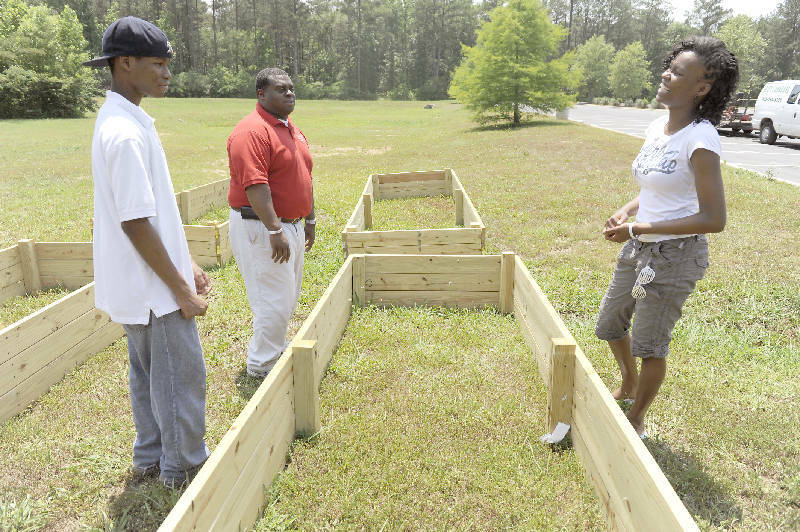 Joshua Miller, left, Lurone Jennings, the youth pastor of the New Covenant Fellowship Church in Chattanooga and Hannah Marshall, right, talk about the vegetables they want to grow during their summer job at the church. Several community garden-related events are scheduled this spring and summer. The Urban League will break ground on its community garden at 12:30 p.m. today at the Urban League office at 730 M.L. King Blvd. New Covenant Fellowship Church at 1326 N. Moore Road is hosting its community garden celebration and picnic from 9 a.m. to 6 p.m. June 25. The Bethlehem Center is registering people for free community gardening classes this fall. Residents will be eligible to receive a free raised gardening. To register, call 266-1384 ext. 15. A Tennessee Titans football player is funding a church community garden that hopes to provide jobs for youth and produce for a community as well as to cultivate relationships between teens and seniors. "Tony [Brown] gave picnics for the people every year," said the Rev. Bernie Miller, pastor of New Covenant Fellowship Church. "I asked him, 'Why not think about teaching people how to eat healthy, grow their own food and make money in the process?'" Brown, a Titans defensive tackle, is a graduate of Chattanooga High School and a member of New Covenant Fellowship Church, which will host a community picnic at the church from 9 a.m. to 6 p.m. June 25. The church will announce its garden and plans to feed its community at the event. New Covenant Fellowship Church is among more than a dozen area churches investing in community gardens that help people feed themselves. Officials at the Bethlehem Center, a ministry of the United Methodist Church, started teaching community gardening classes in January and built 15 raised garden beds for Alton Park residents this spring. Bethlehem Center, 200 W. 38th St.
St. Andrew's Center, 1918 Union Ave.
Joel Tippens, director of the New City Roots Program at New City Fellowship Church, also wants to plant gardens in the East Chattanooga area. The community has been called a food desert because its residents don't have easy access to a grocery store, according to the Ochs Center for Metropolitan Studies. "Most churches are involved in a food pantry operation to help folks who struggle each month to keep enough meals," said Tippens. "You want to be able to help out that way, but many churches around the country are realizing that's not enough. The question is how to move people beyond charity to greater self reliance." Community gardens foster relationships between seniors and youth and cut grocery costs, church officials said. "The community gardens came as a desire to help families realize that they don't have to be totally dependent on grocery stores," said the Rev. Lurone "Coach" Jennings, executive director of the Bethlehem Center. The plan at New Covenant is to plant produce in the garden year-round. Senior residents will advise youth on how to care for the garden and young people will sell some of the produce to the community. Any profits will be used for youth activities at the church. Some produce would also be available for the community at no charge. Miller said he's certain of the need in his community. His church gave out 350 food vouchers for at least $170 each during the week of the April 27 storms. And even without the storms, some residents in his community struggle daily between deciding to pay a significant bill or feed their families three meals a day, said Miller. Contact Yolanda Putman at yputman@timesfreepress.com or call 423-757-6431.